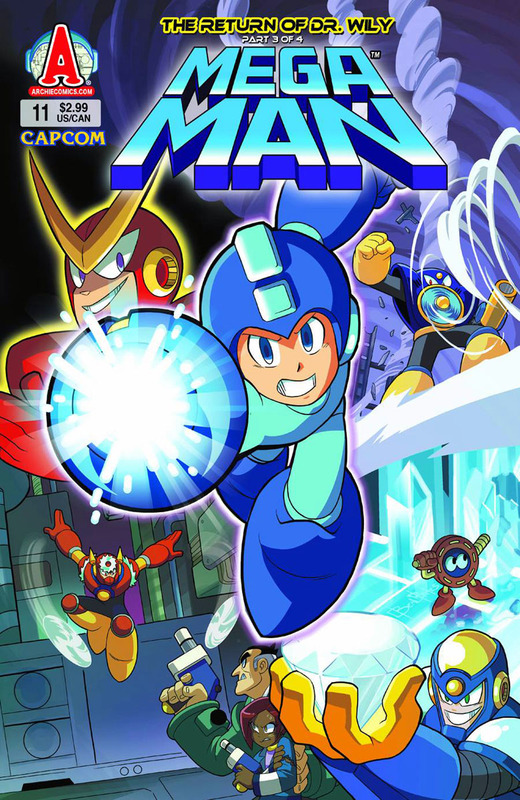 MEGA MAN #11 -- Written by Ian Flynn, art by Ben Bates and various, cover by Ben Bates. "Dr. Wily Returns," Part 3. Mega Man has been in the fight of his life against Dr. Wily's eight new Robot Masters! Fearsome as they are, Quick Man has always been there to mock Mega Man and slow him down. Now, at long last, it's the showdown you've been waiting for! And you won't believe who shows up to help Mega Man at the eleventh hour! 32 pages, $2.99. I gotta say, I'm really digging that cover art. Bates has done an admirable job of mimicking Inafune's trademark style. The color could use some work, but I'm sure things will loosen up a bit when this releases next yet. One more issue to go before we enter an all-new arc! The sooner we jump into Mega Man 3, the sooner we get to see Proto Man/Break Man's Archie debut! In related Archie news, solicitation and cover art for the second tradepaper back volume is up. The 112-page book collects issue #5-8. According to Amazon, we can expect it to ship out on March, 20, 2012. Full details, images and more available at Comics Continuum. On the 11th issue cover: Ben Bates really has a talent for capturing the original artwork closely. True, not Spaz-y, but very impressive for my tastes. Plus Air Man looks BEAST. GO Air Man! On the Vol. 2 cover: I must say, I’m glad that the editing looks better. The first time that image was given, it look so Photoshopped from it’s original smiling Megsy. Though I have to say, I’ve noticed that American comic books typically have frowning people. What, are they all sad? I’m speaking of this as a general issue based on the comic books I own and have seen. Anyway, I hope to be able to find these someday in my local bookstore. Heaven only knows when I will. About the cover's colours: Comics Continuum has this bizarre habit of brightening the colours up on any cover they post. The regular version should be darker. That Quick Man is kinda scaring me. It looks like he intends to do some nasty things to Mega, and I don't mean defeating him in battle either.